The Sealed Modulating Damper System (SMDS) maintains a required pressure (negative or positive) for a common chimney or at individual appliance connector(s). It can be used with Category I, II, III & IV heating appliance systems. The system consists of an ADF Damper with high-pressure and high-temperature sealed bearings. The damper blade is positively sealed with an extremely durable, temperature, pressure and condensate resistant graphite gasket. It protects the boiler connectors from flue gas recirculation when used in a common vent system. The unique damper design prevents condensate from pooling above the damper and the possibility of a slug of condensate flushing into the appliance at start-up. The damper is controlled by an EBC24 Draft Controller that interlocks with the heating appliance(s) and controls the pressure using a bi-directional XTP3 Pressure Transducer. The controller can be installed on the damper itself or remotely on a wall or in a boiler control, as it is prepared for DIN rail mounting. An industry-first solution eliminates the possibility of condensate build-up in the tubing between the pressure sensing stack probe and the pressure transducer. The issue of condensate build-up in the tubing is inherent in applications designed to work under positive pressure. The system is UL-listed and meets all requirements of NFPA54 (ANSI Z223.1), National Fuel Gas Code, IFGC, International Fuel Gas Code and IMC, the International Mechanical Code and most other relevant codes. Condensate-blockage prevention system for positive pressure appliances. 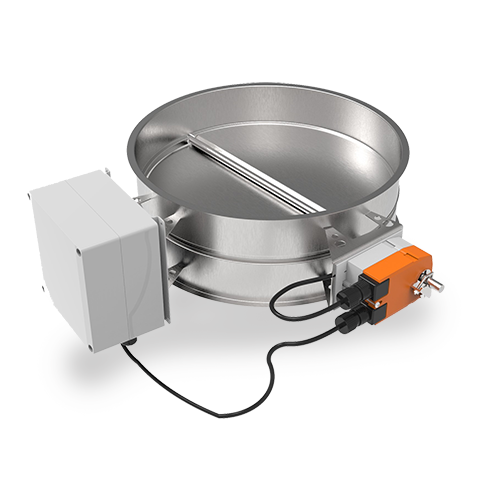 Damper UL-Listed for up to 1400°F continuous operation. “Plug-n-Play” monitors all terminals and registers components attached. Meets all requirements of NFPA54 (ANSI Z223.1), National Fuel Gas Code, IFGC, International Fuel Gas Code and IMC, the International Mechanical Code and most other relevant codes. The SMDS system consists of the ADF, Modulating Damper and the EBC24, Draft Controller. The EBC24 maintains a constant draft for the heating appliances by modulating the position of the damper. The SMDS system is supplied as a complete package with a single-blade damper (multi-blade optional) and attached actuator, control(s), pressure sensor, and draft probe. The appliance is interlocked with the control. A call for heat opens the damper completely. After a programmable pre-purge time period, the EBC24 allows the burner to fire (draft must be established within 60 seconds, or the burner will be shut down). Once the draft reaches the draft set-point the damper modulates to maintain a constant draft. When an appliance shuts down, the damper will close slightly while still maintaining the draft setting. The damper will stay partly open in post-purge mode for a preset time period. The integrated proven draft function will shut down the entire system in case of a power failure to the actuator or other mechanical failure. If the damper actuator has been out of commission for seven (7) days, the Bearing Cycle Activation function will open the damper for a short time and then close again. This is automatically repeated every seven (7) days, if the actuator has not been operating. The system has over-pressure protection, so if excessive pressure builds up between the boiler outlet and the damper, the boiler will be shut down and the damper will open completely to relieve the pressure. Any errors detected during operation are shown on the digital display screen. The Automatic Damper serves as a vent damper that closes the appliance connector, when the appliance is shut off. For chimneys with 1/2" flanged connections. A safe, efficient, easy set-up draft control solution built for boilers, water heaters, and mechanical rooms. Integrated Modbus protocol.